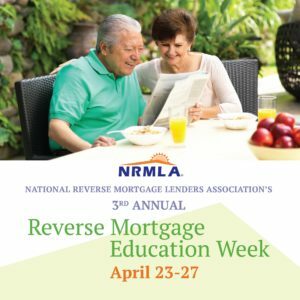 WASHINGTON (April 23, 2018) – Tomorrow through Friday, April 27, as part of its third annual Reverse Mortgage Education Week, the National Reverse Mortgage Lenders Association will host a series of free informational webinars for older homeowners and their loved ones, and the professionals who provide services to meet their retirement needs. During each online seminar, experts will explain scenarios when home equity can be used to supplement savings and support aging in place. “Funding a long retirement has become the premier challenge of aging in America, making it crucial that people are aware of the full range of financial options that may be available to them later in life. NRMLA’s Education Week brings together experts from across industries to present situations when proceeds from a reverse mortgage loan can solve discrete funding needs–such as paying for in-home care or purchasing a new home–and for longer term goals, including ongoing financial management,” said NRMLA President and CEO Peter Bell. The Reverse Mortgage Education Week webinar series features the following presenters: leading retirement income planning expert and author of Rewirement, Jamie Hopkins from the American College of Financial Services; Urban Eldercare, LLC Owner and President of the Aging Life Care Association Nancy Avitabile, LMSW, CMC; Becky Bell, CFP®; NRMLA President and CEO Peter Bell; Home Care Association of America Executive Director Phil Bongiorno; Chris Bruser, CRMP; Blue Ocean Global Wealth CEO Marguerita Cheng; MagnifyMoney Co-Founder and Head of Content Nick Clements; Realtor® Scott Degnan with MyHomeGroup; National Council on Aging Director of Home Equity Initiatives Amy Ford; AMR Care Group Client Manager and President of the Long Island Aging in Place Council Laura Giunta, CSA; Christina Harmes, CRMP; Century Residential and Mastercraft Homes Vice President Scott Owens; Executive Director and Chief Population Health Officer of Square Care, LLC Kelli Vasquez, LCSW; NRMLA Education Committee Co-Chair Dan Hultquist, CRMP, and committee members Lorraine Geraci, Judson Lyman, and Patty Wills, CRMP; and Richard Eisenberg, Senior Web Editor of the Money & Security and Work & Purpose channels of Next Avenue and Managing Editor for the site, who will moderate a live Q&A about using home equity during retirement. More information about Reverse Mortgage Education Week webinars and registration links are available below. NRMLA is partnering with Next Avenue, the public media website for America’s booming older population, to answer reader questions about using home equity to supplement retirement savings and support aging in place. Most aging adults would prefer to stay in their own homes for as long as possible, even when they require daily assistance. But finding the resources to pay for that in-home care can be a challenge. This webinar is for older adults, their children and loved ones, who are searching for financial solutions to manage the costs of home care. NRMLA is partnering with the online real estate community ActiveRain to host a free webinar about HECM for Purchase and the value it brings to older homebuyers. NRMLA is sponsoring a free webinar for the American Society on Aging to educate professionals who work with older adults about the financial tools and resources their clients can use to pay for in-home care. This free webinar for financial advisors will focus on incorporating home equity into a comprehensive retirement financial plan. Speakers will discuss scenarios when a reverse mortgage loan proceeds can improve liquidity and portfolio longevity. The National Reverse Mortgage Lenders Association (NRMLA) is the national voice for the industry and represents the professionals responsible for more than 90 percent of reverse mortgage transactions in the United States. All NRMLA member companies commit themselves to a Code of Ethics & Professional Responsibility. Learn more at www.nrmlaonline.org.